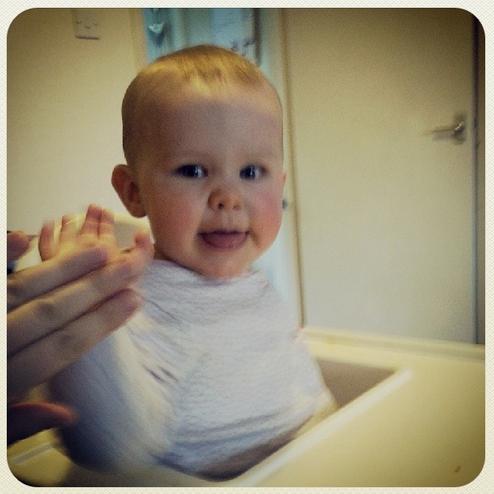 I regularly read Katie’s Blog (Mummy Daddy Me) and have been inspired to document our Ordinary Moments, as Katie does. These Ordinary Moments are the everyday, special low key moments, that I want to be etched into my consciousness forever. Over the Christmas break Mr Hubby taught Baby to high five. She was so pleased with herself, grinning from ear to ear. She spent the majority of the holidays with her hand aloft, demanding people run across the room to high five her. She loved it. Mr Hubby asks her to “Give me some skinz Baby” and she will give him a high five, with a massive smile thrown in for good measure. So silly, but so lovely. I never tire of seeing how happy she is when she achieves these things. She still smiles like a Cheshire cat every time she claps. I love watching my beautiful baby develop and learn, having so much fun along the way. Ahhhh that is so cute!! Can’t wait to teach Arthur to high 5!! !